The Prolight 575 Watt HMI Fresnel light combines the advantages of single-ended lamp technology with a short focal Fresnel lens to optimize light performance, while considerably reducing size and weight. The light can be used with an optional 575 watt single-ended HMI bulb and gives extremely high output in spot mode. While in flood mode it provides a smooth, even, beautiful spread that will make you think the light has much higher wattage. When fitted with a 575 watt HMI bulb, this fixture will emit a beam of 1512 footcandles 2.2 feet in diameter from a distance of 15 feet, @ full spot. This fixture will emit a beam of 228 footcandles 15.6 in diameter from 15 feet, @ full flood. 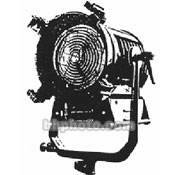 Focusable compact fresnel head with Safety Switch, selector for 125W or 200W operation. Different ballasts are available to power this fixture. Accepts 9" diameter accessories, available separately.